Objective 1: Participants will write 2 specific points discussed in each of nine chapters in this e-course. (II. A.1-2, III.B.3, IV.A.3, IV.B.4). Objective 2: Participants will write 5 points describing health disparities and discrimination for the spectrum transgender clients, and will write 5 points for a music therapist to consider when working with transgender clients. (I.D.9, II. A.1-2, IV.A.1-7, V.B.4). Objective 3: Participants will describe five points for a music therapist to consider when being an ally who advocates for LGBTQ clients, families, students and co-workers (II. A.1-2, IV.A.1-7). 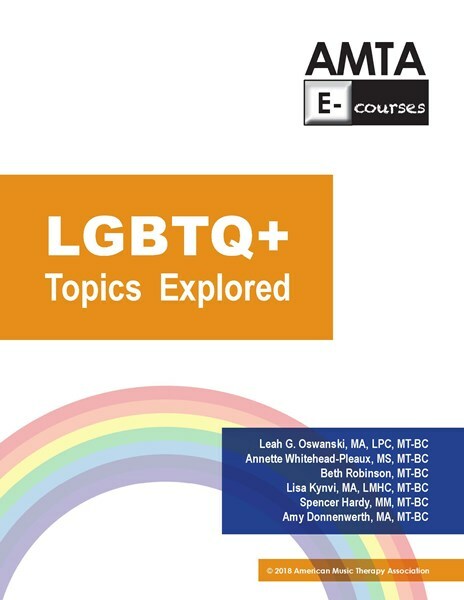 Objective 4: Based on information in Chapter 9 of the e-course, participants will list two recommended clinical best practices, two recommended work environment best practices, and two best practices for education and clinical training in music therapy for LGBTQ clients and colleagues. (I.D.9, II.A.1-2). All rights reserved. No part of any AMTA E-course, the workbook or the audio, may be reproduced or transmitted in any form or by any means, electronic or mechanical, including photocopying, sharing links, recording, or by any information storage or retrieval system, without prior written permission from the Executive Director of AMTA. The AMTA E-courses are approved by the Certification Board of Music Therapists (CBMT) for the specified number of Continuing Music Therapy Education credits (CMTE). The American Music Therapy Association (#P-051) maintains responsibility for program quality and adherence to CBMT policies and criteria. AMTA E-Course Cancellation/Refund Policy: Refunds for cancellations are available by written request only and must be mailed or emailed to the AMTA national office. 80% of fees will be refunded due to handling/processing time. NO REFUNDS will be made if a CMTE course certificate has been issued. Please plan ahead. Refunds are processed within 45 days of request. You are responsible for providing a valid postal address where a check can be mailed and received. Banks do not accept checks more than 90 days after their issue date, so please present this check to your bank for payment as soon as possible in order to insure you are able to access the funds. Checks uncashed after 120 days will be voided.